You Are Listening To "The Pennsylvania Polka"
is composed of a blue field on which is embroidered the State Coat of Arms. Two horses support the Coat of Arms and an American Bald Eagle sits proudly atop. The State Motto is: Virtue, Liberty and Independence. 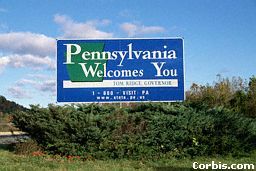 Pennsylvania is bordered by Delaware, Maryland, New Jersey, New York, Ohio and West Virginia. This lovely flower is the Mountain Laurel, Pennsylvania's State Flower. In the Spring, the woods and mountains appear to be carpeted in pink, white and lavender. This pretty little fellow is Pennsylvania's State Bird, the Ruffed Grouse. It's a game bird and studies are now underway to look into the decline in population of this bird. Looking straight up at Pennsylvania's State Tree, the Eastern Hemlock. These trees grow 60 to 100 feet tall and have among the smallest cones of any conifer. The State Song of Pennsylvania is (what else?) Pennsylvania. We think it's time to do some traveling so everyone into the Chevy, fasten those seat belts, and we'll head for Philadelphia, Pennsylvania's largest city. Just click on the license plate, and we'll be on our way.